After 25 years as a successful marketing executive for large, big brand accounts, Carolyn Scharf made a very gutsy move—the single mom left the security of her job and set up her own business. Carolyn chose the spa industry because of the growing awareness of massage therapy and its benefits. The benefits of regular massage therapies are very apparent these days for lowering stress and treating muscle tension. 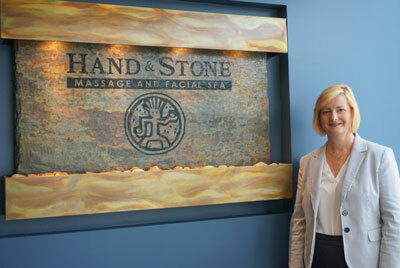 After researching various options, she opened the Hand & Stone Massage and Facial Spa on Kingston Road in July 2017. Becoming a franchise owner meant a big personal investment, especially for a single mother. Carolyn points out that she’s not some “big chain”; the business is hers, and making the business a success is up to her. Fortunately, she’s had great support, especially from her young son, William, who even cut the ribbon when the store opened a year ago. After a year in business, Carolyn describes her first year as “amazing”. “People in this community are just so incredibly nice,” she says. This fall, Carolyn is hosting a one-year anniversary party. A true family affair, William is already helping with the plans! Located along the popular Kingston Road “Upper Beaches” strip, Carolyn finds that it’s more like working in a small village than the middle of a big city. There’s so much foot traffic, in fact, many people just stop by to say hello! Growing up, Carolyn was a girl “from the north.” She lived in Sudbury, then Chapleau, and attended high school in North Bay. But for over a decade, Carolyn has lived at Queen and Greenwood, and her son attends Pape Avenue Public School. In fact, most of the 15 full and part-time staff who work at the spa also live in the area. The first impression that visitors have when they enter Hand & Stone is the beautiful, calming décor. For the many customers who come for therapeutic treatments, this makes it possible to have a clinical treatment with Registered Massage Therapists, but enjoy all the luxuries of a spa environment. “About 70-80 percent of our massages are therapeutic massages,” says Carolyn. This also means customers with insurance coverage can receive receipts for therapeutic treatments. Facials are another popular choice, and with the number of staff and rooms, many women come with a friend for a girl’s “getaway”. But Carolyn notes that the real benefits of skin care and massage come when you have regular treatments. This is where the monthly subscription package offered at Hand & Stone is so popular. The price point makes regular treatments accessible to people who otherwise might find a one-time treatment too pricey. The full service spa offers various massage therapies as well as facials and skin care treatments. She also carries top line skin care products from Dermalogica and Yonka, a plant derived and holistically formulated product line with essential oils.